Cold Brew Coffee is my new addiction. I hate to even admit I was buying the pricey tetra boxes of it at the local grocery store. The costs were upwards to $9 a carton. I love cold brewed coffee because the process takes the bitterness out of the end product. Then, I discovered how simple it is to make at home. ​Place 1/2 cup of the coffee grounds in the bottom of 2 separate quart mason jars. Add 1 quart of water to each of the two jars, reaching up to 1/2 inch from the rim. Be sure to stir the coffee and water, to dampen the grounds. Place the lid on the jars and allow to sit for 12-15 hours. I do this in the evening so that I can do the finishing steps the next morning. 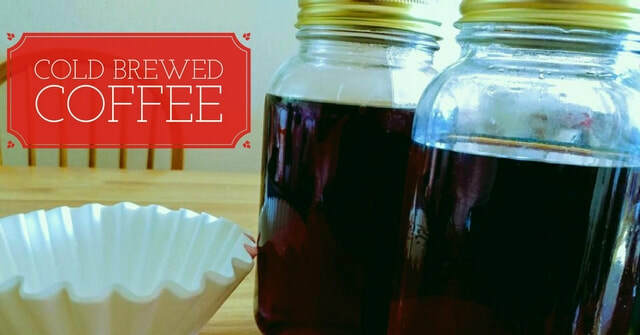 After the jars have sat for the required time, place a coffee filter in the top of each of two remaining jars. I secure mine with an elastic band to make for easier straining. See photo below.